When I first began my Spence research over twenty years ago and discovered the name of Elisha and Susanna Spence’s second child, I noticed only a “J” for his middle name on various records. I presumed Levi’s middle name was “John” since Susanna’s father was John Spencer. While recently updating my research on Levi, I discovered the name “James” more frequently among his children than “John.” And after changing his name on my records to Levi James Spence, I began making some remarkable discoveries! Levi James Spence was born in Mecklenburg County, North Carolina on October 25, 1801–the second child and son of Elisha Spence (1776-1835) and Susanna Spencer (1785-1810). He joined his older brother, Samuel Perry Spence (1800-1859), who was born in Greenville, South Carolina the previous year. The Spence family had moved to Mecklenburg County during the fall of 1800. Susanna’s father John Spencer (1750-1801) died in 1801. At the time of John Spencer’s death, the young Elisha Spence family was in the process of moving to Randolph County, North Carolina, a move they completed as soon as Susanna and the infant Levi were able to travel. Randolph County, North Carolina had been a second home for Elisha Spence, so he was really glad to get back there. Shortly after his father’s death, he moved in with his uncle, James Spence (1730-1804). James would only live for three years after Elisha’s return and would pass away in 1804. After his uncle’s death, Elisha often traveled back and forth between Randolph and Pasquotank and Camden Counties. Many of his friends and family members had already moved to Tennessee. Elisha planned to do just that, especially after the Jones families’ departure. Young Samuel and the infant Levi were oblivious to all the excitement. Pasquotank and Camden Counties meant a great deal of fawning by family and friend admirers. While the men huddled in one corner of the porch talking about matters of importance to them, the women gathered in another area to talk about their interests. The children took Samuel and Levi under their care and entertained them in the yard. Then the fiddles came out at night, followed by singing and dancing. Levi would not remember those earlier times, but Samuel recalled many of them. For his part, Levi remembered a family who frequented those occasions. He was three years old when presented with a new infant member of that family. Levi peered into the sleeping face of the baby. Elizabeth Gray was born May 1, 1804 in Pasquotank County, North Carolina to Thornton Gray (1775-1830) and Mary Frances Porter (1785-1819). Three years apart in age, young Levi Spence and Elizabeth Gray became inseparable whenever the Spences were in the area. This childhood romance continued to grow over the coming years. Finding this Gray family was like looking for a needle in the haystack. A number of Grays settled in North Carolina–some connected by blood while others were only connected by name. A major branch of the family settled in Stafford County, Virginia, many of whom relocated to Pasquotank, North Carolina. Another branch settled in Dobbs County in an area that became Lenoir County in 1791. Still another branch found lodging in Randolph County, while others settled in Mecklenburg. The only clues I had to this confusion consisted of two names: Thornton Gray and his wife Frances. Beyond that, I knew nothing more. Then, finally, I experienced a breakthrough. The following is a brief summary of the early family. My focus here is on the twins, Thornton and Griffen. I provide the rest of the information for background that represents the sum and substance of my current research. My research is by no means completed. So many of the Gray records have been jumbled, it is difficult to find two people who agree with one another. The absence of official or original records makes the process much more difficult. With this in mind, I will focus the rest of the Gray material on the twins. (e) Luckey Spence, b. 1800(8). Newton, Rencher and Brittain would relocate to Davidson County, Tennessee with Elisha Spence. I have referenced them in my earlier article: “The Mystery of William Spence (1795-1869)”, which is the first article in the Spence series. Thornton Gray (b. 1775) died in McCracken County, Kentucky after the 1850 Census. His wife–Elizabeth Ann Russell–will reappear in the next entry. Elizabeth Ann Russell Gray died December 26, 1917 in Celina, Clay, Tennessee. 1776 GRAY, THORNTON, Elizabeth (wife); Judah, Catherine, Julia, Barthema, Thornton(12). Contrary to my presumption in Part Four, Levi James Spence did not go to Perry County, Tennessee in 1820 with his brothers, Samuel and Daniel. The Thornton Gray family, including Levi’s beloved Elizabeth, planned to head back to North Carolina. Levi wasn’t going to risk losing her to someone else. So he went to North Carolina with the Grays, where he appears on the 1820 Census in Lenoir County. Thornton set him up there with relatives, but Levi was back in Pasquotank County every weekend. He and Elizabeth were married in New Hanover, Pasquotank, North Carolina in 1824. After Thornton’s death, they returned to Tennessee and settled in Madison County. 2. Thornton Spence, b. 1827. He may have died young. I can find nothing else about him. 3. Mark Spence (1829-1852). Mark was born May 17, 1829 in Madison County, Tennessee, and he died of cholera in St. Louis, Missouri on September 27, 1852. He appears to have remained single. 4. William W. Spence (1832-1910). William was born January 17, 1832 in Tennessee, and he died after 1910 in Paducah, McCracken, Kentucky. He married Mary Ann Moore (1833-1920) on October 26, 1859 in McCracken County Kentucky. Their children were: (a) John W. Spence (1861-1924); and (b) Thomas Duncan Spence (1865-1947). 5. Joseph Martin Spence (1834-1914). Joseph was born October 26, 1834 in Graves County, Kentucky, and he died June 13, 1914 in Oxford, Sumner County, Kansas. On August 27, 1856, he married Elizabeth Jane Browning (1836-1906) in McCracken County, Kentucky. Their children were: (a) William Henry Spence, who was born August 20, 1857 in McCracken County, Kentucky and who died in 1925 in Oxford, Sumner, Kansas; (b)Jacob A. “Jack” Spence, who was born November 1861 in McCracken County, Kentucky, and who died in 1925 in Sumner County, Kansas; (c) Thomas Spence (1863-1935), who was born March 24, 1863 in Paducah, McCracken, Kentucky, and who died December 13, 1935 in Arcadia, Oklahoma; (d) James Eli Spence (Eli James Spence–he used the name Eli), who was born September 1864 in McCracken County, Kentucky, and who died before 1910 in Guthrie, Logan, Oklahoma; (e) Mary June Spence, who was born September 1866 in McCracken County, Kentucky, and who died in 1942 in Oxford, Sumner, Kansas; (f) Deelan B Spence, who was born June 1870 in McCracken County, Kentucky, and who died before 1880 in McCracken County, Kentucky; (g) Lou Ella Spence, who was born about 1872 in McCracken County, Kentucky, and who died after 1880 in McCracken County, Kentucky; (h) Lottie Spence, who was born October 1, 1874 in Paducah, McCracken, Kentucky, and who died August 14, 1955 in Kansas. 5. Elizabeth Frances Spence (1836-1925). Elizabeth was born in Kentucky December 22, 1836, and she died in Oklahoma City, Oklahoma May 31, 1925. On January 29, 1857, she married John William Wyatt (1829-1876) in McCracken County, Kentucky. Their children were: (a) Medora Mary Wyatt (1857-1884); (b) Virginia E. Wyatt, born 1860; (c) James Lewis Wyatt (1862-1935); (d) John Melvin Wyatt (1866-1949); (e) Allen A. Wyatt, b. 1873. 6. Thomas J. (James) Spence (1839-1928). Thomas was born May 9, 1839 in Tennessee, and he died April 15, 1928 in Sumner County, Kansas. His wife’s name was Malena. Their children were: (a) James C. Spence (1867-1947); (b) Thomas Levi Spence (1871-1930); (c) Fannie M. Spence, born 1879; (d) William P. Spence, born 1884. 7. Littleton F. Spence (1843-1876). Littleton was born about 1843 in Kentucky, and he died January 19, 1876 in McCracken County, Kentucky. His wife was Alice B. Crawford (1848-1916). They had one known child: Edward Spence, who was born in October 1869 in McCracken County, Kentucky(13). Howard and I lived in Bowling Green Kentucky from 1969 until 1970. We drove through Paducah, McCracken County, Kentucky numerous times while traveling between Bowling Green and Farmington, Missouri in order to visit Howard’s parents. I did not realize I had all these ancestors living in McCracken County! My Grandfather Spence once thought his father’s family originated in Kentucky. They didn’t, but a large number of family members certainly settled there! When Levi and Elizabeth Gray Spence returned to Tennessee, they settled in Madison County, where they appear on the 1830 Censes(14). Elizabeth’s brother, Thornton Gray (1802-1850) had settled in Jefferson County, Kentucky, where he appears on the 1830 Censes. By 1843, Thornton moved to McCracken County, where he married Elizabeth Ann Russell (1829-1917)(15). Levi and Elizabeth’s first four children were born in Madison County, Tennessee but in 1834, the family made a sojourn into Kentucky, where Joseph Martin Spence was born in Graves County. From there, the family moved to McCracken County, Kentucky, where Elizabeth’s brother, Thornton, lived. Then in 1840, Levi and his family moved to Weakley County, Tennessee, where they appear on the Census that year. The youngest son Littleton was born in Weakley County in 1843. In 1840, Elizabeth Gray Spence’s younger brother, Charles Porter Gray (1819-1890) was living in Williamson County, Tennessee, where he appears as married with a young son and daughter under the age of five(16). This would have been his first family; I do not know their names, and I do not believe they survived. Levi James Spence moved to Weakley County because a younger brother (William) had settled there. He and his family had returned to North Carolina, and then moved back to Tennessee. 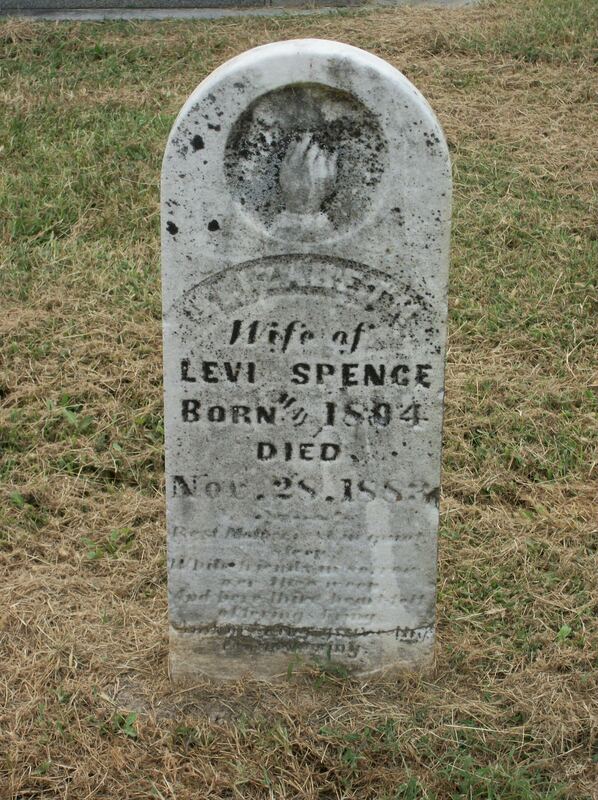 Levi James Spence died in Weakley County, Tennessee in 1843. His wife, Elizabeth Gray, returned to McCracken County, Kentucky shortly after his death. She appears on the 1850 Census with her children: James (age 24); William W. (age 18); Joseph M. (age 15); Elizabeth F. (age 13); Thomas J. (age 11); Littleton F. (age 7)(17). She appears on the 1880 Census for Woodville, McCracken, Kentucky, and she lived there the last three years of her life(18). She died November 28, 1883, and she is buried in the New Liberty Cemetery, Woodville, McCracken County, Tennessee(19). (8)Samuel Spence Last Will & Testament (1805), Microfilmed opy obtained from the North Carolina State Library and Archives, Raleigh, North Carolina.